Fr. Dayakar & Eight artists of Prerana Kalamanch from Varanasi under the organization of Suchetna Bareily Diocessan Social Service Centre, performed the Nukkad Natak (Street Theatre) on the themes of environment, corruption and education of Girls in the Villages of Bazpur, Katgodham, Jollikote, Ranikhet, Bhawali & Chaubatiya from 20th to 28th May. The artists were highly appreciated in the villages for their acting and as well as for the message being communicated through the plays. The enthusiasm of the people to learn something on the plays enriched and encouraged the artists. Special thanks to Fr. Peter, Fr. Ivan, Sr. Reshma, Sr Monica, Mr. Giriraj& Mr. Gaurav who have helped us to reach out to these places to bring awareness among the people. Twelve artistes of Prerna Kala Manch, along with seven members of Santvana Community, Delhi and two counselors of IMS Dhyana Bhavan, Alapuzha performed beautifully SNEHABALI, the passion play (the sufferings and death of Jesus) in Malayalam language in 14 churches of Kerala from 7th to 22nd March 2017. The artistes were highly appreciated for their accomplished acting and perfect lips synchrinization. The audience appreciated the heart-touching message of the play, the well written script, melodious songs, the symbolic yet simple stage settings, the highly professional lighting and sound. We are happy that the message of love and brotherhood has been reached to thousands of people in an effective manner. Care for Air campaign against air pollution took us to various parts of Varanasi, Allahabad, Kanpur, Agra, Jaunpur and Singrauli in January and February 2017. 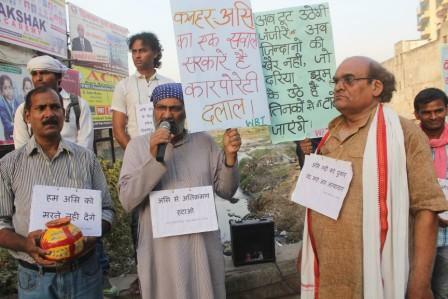 Just prior to the assembly elections in UP, a unique camapign called 100% UP, was also carried out which included street plays, songs, rallies, signature campaign and an advocacy with political parties appealing to them to make UP 100% free from air pollution and to make this as part of their election manifesto. The camapaign resulted in some of the parties including steps to control air pollution in their manifestos. VJJSS organised a seminar in collaboration with Green Peace and WBT against air pollution. We also hosted a few programs of Green Peace on creating stories for Radio. Fr. Dayakar participated in a program of Green Peace in Lucknow making strategies for reducing air pollution. On 13th October, the World Sight Day, collaborating with Vision Project, Bangalore, CARDS Delhi and different social organisations of Varanasi VJJSS gave a lead to a Blind Walk from Shaheed Udyan, Sigra to Bharat Mata Mandir. More than 500 sighted people were blindfolded and were led by almost 100 visually impaired people. It was a unique experience. VJJSS gave lead by singing awareness songs during the rally and organised the cultural programs in collaboration with Jeevan Jyoti School, Sarnath. This was a unique opportunity to motivate people to pledge for eye donation. The unprecedented flood in Varanasi, was a unique opportunity for VJJSS to share solidarity with the large number of people whose houses were inundated in flood waters. From 22nd August to 3rd September VJJSS coordinated fund raising, collection and purchase of relief materials, packing and distribution of these materials in collaboration with various partner organisations, educational institutions. Fr. Dayakar, Br. 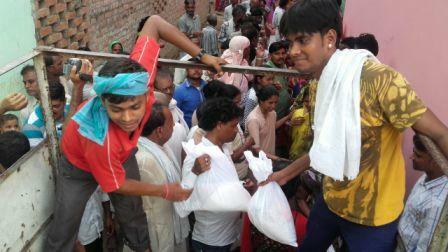 Andrew and Rajender rai of Kiran Centre along with Sr. Prabha OLP worked hard to collect money and materials. With the help of many supporting hands we were able to reach out to 15 mohallas/slums and a few villages of Varanasi and Mirzapur Districts. 2183 families were helped with releif materials. Varuna and Assi rivers make Varanasi. Our Campaign to save Varuna is on the way is a huge success as the is working hard is give new life and look to Varuna. We had kept up the Campaign to save Assi river which is a victim of encroachment, neglect by the civil society and administration. On 27th April 2016, along with member of various social organization of Varanasi we gathered at Assi Bridge with placards and leaflets. PKM Artistes sang songs appealing for clean water, clean revers and clean city. Under the leadership of Father Anand and Father Dilraj of the Indian Missionary Society, the volunteers got into filthy water with their spades, brooms and baskets for a massive cleanliness drive. The campaign began at Kedar Ghat where hundreds of Hindu sadhus, priests and civilians were sitting on satyagraha. After a common prayer along with people of other religious faiths, the Christian volunteers picked up garbage consisting of polythene bags, left over ritual materials, old dirty clothes, glass pieces etc. Catholic priests, Protestant pastors, religious sisters, students of theology and philosophy, Christian laity from various churches and cultural and social activists belonging to Hindu and Muslim faiths cleansed 700 meters long stretch covering five ghats. (River Ganga flows through 84 ghats in Kashi, the most ancient living city of the world.) They transported the garbage by a boat to the other side of the river and dumped them far away from human habitation. Shri Pramod Manjhi, president of the boatmens association was standing with folded hands inside the river from dawn to dusk as a tapasya (austere practice). Similarly some others were performing buddhi-shuddhi yagna (ritual sacrifice for a sound mind) for the national leaders. Everyone of them wanted the government to act. Fr. Anand told this reporter that he is convinced that Ganga can be cleaned only with the cooperation of the local people. For this, there is a need of mass awareness among the local people, the pilgrims and the priests. Much of the filth is caused due to the materials used for rituals. The pujaris (priests) and others involved in arati and other ritualistic acts have to change their mentality, said Fr. Anand. The volunteers distributed copies of a leaflet containing 10 appeals to the administration and the civilians appealing for a new mindset. The appeal challenged the traditional practice of pushing five types of dead bodies to float in the river. They are the bodies of children below five years, pregnant women, people who die of snake bite, chicken pox and white-leprosy (with the hope of their coming to life by the grace of Mother Ganga).